My son listened to every tape that I bought or made for him. He loved stories most of all, and never went to sleep without a tape with a story. And, as most children, he could never get enough of some stories. Ibbeltje , Pipo de clown , De Vakantie cassette , everything written by Roald Dahl, Tommie en Lotje , just to name some of the tapes that he played to death. My daughter has no interest at all in stories, and now my son is 13 and a bit beyond childrens’ stories, I get all my tapes back bit by bit. Today I got a whole box. It took me half an hour to put all the cassettes back in the right boxes again. And there are still some missing. 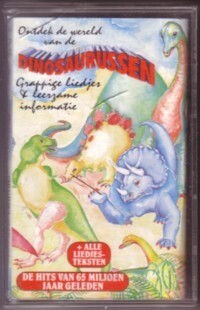 Among the tapes that I like best, is one called Ontdek de wereld van dinosaurussen . It has both songs and stories, and although it is educational, it is worth listening to. I just Googled it, but for Google the tape doesn’t exist. It was originally produced Blue Strike Music, England, and the tape that I bought was reworked by the Flevo Sound Studio. They did a great job! Here is my favourite song of this tape, Wij pterodactylussen .